Galleries, libraries, archives and museums can make it easier for people to find and use their digital collections — and can so enrich the lives of a wider audience — by sharing and combining collections. Learn how you can use an open-source tool to aggregate, manage, search and share your digital collection records. 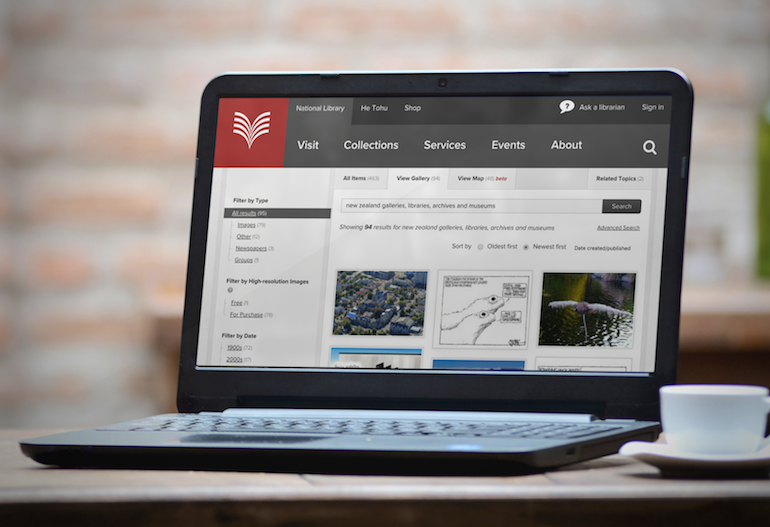 Galleries, libraries, archives and museums often have multiple digital collections. These may have been acquired at different times, result from mergers, or feature different types of artifact or resource for example. Combining these collections makes it easier for people to explore the riches within. And sharing these collections outside your own digital platforms gets them in front of a wider audience. The problem is that it’s hard to combine and share collections when their records are set up in different ways. More often than not the information about digital assets — the metadata — is structured differently in different collections. share the collection, and let other developers build tools that use your data, via an Application Programming Interface (API). One such solution is Supplejack. Built for New Zealand’s National Library, Supplejack is the set of tools that powers the award-winning DigitalNZ website and API. Because it’s built for the GLAM sector, galleries, libraries, archives and museums can use it out of the box. And because it’s open source you can also customise it to suit. Learn more about the history and capabilities of the Supplejack metadata aggregator and search platform (along with where the name came from). create and manage an API that lets you share the collections with external sites. It can harvest the records in a wide range of forms including XML, HTML, RSS, JSON, OAI-PMH and RDF/XML. Ngā Taonga Sound & Vision is New Zealand’s moving image and sound archive. It was formed when the Film Archive, Radio NZ sound archives and TVNZ archives were merged. In order to share New Zealand’s audiovisual taonga or treasures as widely as possible, the archive wanted to pull them together into a single site. “We want something nice and easy for the public to use, through a single search, without them having to go to many different databases to find our offerings,” said Ellen Pullar, Ngā Taonga Sound & Vision’s Digital Programme Developer at the time. The archive uses use Supplejack to harvest metadata from each collection, and standardise comparable fields across the different collections while retaining the attributes that are specific to the different media. “Another real advantage is that we are able to store the playable media files for film and audio in separate places and on different formats — Supplejack knows where to find them, and is automated to pick up new media files when they’re added, and bring them together online,” she said. Learn more about how Ngā Taonga used the Supplejack web application. Supplejack can improve the ease with which users find items in your digital collections, and the experience they have when they do. The Supplejack platform includes an API that you can use to share your collection with other institutions. This can be especially useful when you have partnerships or travelling shows. In particular, if you’re a New Zealand institution (or you have New Zealand content), you can promote your collections on DigitalNZ. DigitalNZ is a one-stop search site where you can find, collect and share Kiwi culture online. It gives easy access to over 30 million items from more than 200 content partners. Federated search is an approach that lets you search multiple information sources, a key capability of Supplejack. Many approaches to federated search involve searching across a number of indices. In contrast, the Supplejack content aggregator creates a single consistent index. This means users get consistent search results, making it easier for them to scan the search results pages to find the result they’re looking for. It also tends to give users the results faster than the multi-index approaches, though the index is only as up-to-date as the last harvest. Ngā Taonga use Supplejack to index non-collection content on their website. This lets users search in a single place to find both items in the collections and general information about Ngā Taonga. If you work in a library, about now you might be thinking, “ah, you mean a discovery layer”. A discovery layer is a single search across multiple library catalogues or other resources. By providing this single search, Supplejack helps your improve internal or catalogue search experience. You can see this in action on New Zealand’s National Library website, which uses Supplejack for all its search functionality. Many GLAM sector institutions have digital collections made up of photos, videos, audio files, scanned documents and the like. But without quality metadata, it’s often hard for search engines like Google to understand what these rich media items are. Using Supplejack to transform and enrich your metadata means you can ensure search engines have an accurate and comprehensive understanding of each item. As a result these items are more likely to feature in relevant searches, helping more people find them. If, for instance, you have a number of videos in your digital collections you can structure your data so that Google can highlight it as a video result. We’ve also successfully tested improving metadata with off-the-shelf Artificial Intelligence tools, using Machine Learning to identify the subjects of items. You can then add this information to the metadata for the item, making it easier for search engines, and their users, to find. As with your physical collection, the way you describe your digital collection can have a big effect on the experience your audience has. So having consistent, complete and engaging metadata is an important part of your online interpretation work. Sometimes this can require a change in mindset or process. That’s because some institutions can think of metadata as more of an internal tool. Similarly, galleries, libraries, archives and museums sometimes find that metadata that historically was used only within your institution is now exposed to the public. Supplejack helps you choose and improve the metadata you associate with items. In doing so you can enhance people’s understanding and experience, enriching their lives. If you’d like to learn more about Supplejack, contact James on +64 4 939 0062 or at [email protected].